What is the SMART Center? SMART stands for Steppingstone MAgnetic Resonance Training. The SMART Center is a laboratory equipped with advanced scientific instrumentation (a Bruker Bio-Spin electron paramagnetic resonance spectrometer) that is open to students. The vast majority of science majors would never use this kind of equipment even at a university. Chemistry and physics majors might use it in graduate school. 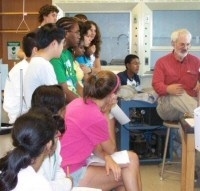 Dr. Philip D. Morse, Professor Emeritus of Chemistry from Illinois State University, has 30 years of experience with EPR spectroscopy, published 50 scientific papers in the fields of biochemistry, biophysics, and computer science and has established the SMART Center so that students as young as fifth grade can learn to explore the universe of molecules and study their movements in cells, tissues, and other materials. The SMART Center is a place where you can come to do science as scientists do it. It is a place where you can ask questions about the world around you and learn to get answers with a research scientist at your side. Why was the SMART Center started? The United States is behind many other countries in providing educational opportunities for students in math and sciences. 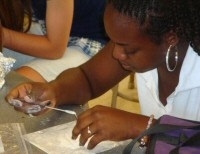 Students usually do not have the opportunity to experience an actual scientific environment until college or graduate school. The SMART Center seeks to provide an avenue by which students interested in science can, early in their careers, participate in a real research environment using advanced instrumentation. What is the purpose of the SMART Center? The purpose of SMART Center is to provide students the opportunity to use advanced instrumentation to engage in scientific research of their choosing. The staff of the SMART Center are employed to assist the students in learning how to use the instrumentation, what kinds of scientific questions can be asked using this instrumentation, how to design the experiments and interpret the data, and how to present their results to a general audience. How is working at the SMART Center different than working in a research lab? The SMART Center differs from an academic research environment in one fundamental way – at the SMART Center, the professor works for the student while in an academic research lab, the student works for the professor. What experience do the staff of the SMART Center have? The Director of the SMART Center, Dr. Reef (Philip D.,II) Morse, has over 30 years of experience in research, teaching, and developing students. He has 50 peer-reviewed publications in areas of magnetic resonance, cell structure, physical biochemistry, computer programming, and surface chemistry. His relationship with Dr. Arthur Heiss at Bruker Bio-Spin was pivotal to bringing the Bruker ESP300 EPR Spectrometer to Steppingstone. He has taught students from post-Doctoral fellows to early Kindergarten. The Head of School at Steppingstone, Kiyo Morse, has over 30 years of experience educating gifted and talented students. She has a Master’s Degree in genetics and experimental design and analysis and provides additional support for the SMART Center through the auspices of Steppingstone. Can I get an experience like the SMART Center somewhere else? This program is unique – as far as we know, nothing like this has ever been tried before. No other primary or secondary school has access to an EPR spectrometer, especially in conjunction with the background of the SMART Center staff. The participants in the SMART Center are forging a new path in science education and the science experience. Why would I want to use the SMART Center? That’s up to you to decide. The SMART Center offers a place where you can pursue scientific questions much as scientists do. It allows you to use equipment that most college students would never be allowed to use. But it requires effort, discipline, focus, and a willingness to ask questions and to make mistakes. With this responsibility comes the freedom to explore your world as few others can. How do I get in to the SMART Center? Apply. Download the application form. Submit your application by mail or FAX. Applications are evaluated based on completeness, geographic location, references, the essay, availability, and other considerations. Just because I submit an application, will I get in to the program? No. The application is a request for us to consider you. Usually there are several applications for each available spot in the program. Do I have to submit a high-school transcript? That would help. If you wish, you can cross out the grades. What’s important about the transcript is that it shows what experience you have. Grades are certainly not the only thing that we consider in an application. What are the most important things about the application? Make it legible. Word processing is best. Remember that if you FAX in the application, the quality of the FAX we receive is usually much poorer than the application you send, so make sure everything is easy to read. Get letters of recommendation from your references. You don’t have to send them in with the application, but you should make sure they are received by the SMART Center before the application deadline. The application must be your work, and your work alone. Sometimes helpful parents want to fill in the information for you, but this will disqualify your application. We are accepting you into the program and we want to know about you. Write with passion. Tell us who you are. Use extra pages as necessary. The best short description of EPR is available at http://www.bruker-biospin.com/cw.html. It is a method to detect, and measure the properties of, free radicals. Not all free radicals are “bad” and, indeed, they occur frequently in such foodstuffs as coffee and toast. At the SMART Center, the focus is on the use of artificial, stable free-radicals to study the motion and distribution of molecules in different cells, tissues, and systems. How is my participation in the SMART Center different from working in someone’s research lab? In someone else’s research lab, you are usually in a laboratory that already has a defined research goal that has been determined by the chief or professor in charge. You work for them. At the SMART Center, the chief or professor (in this case, the director) works for you. The director is much more of a coach or guide rather than someone who tells you what do to. Thus, the burden of success or failure rides mostly on your shoulders. The course is rigorous, demanding, and likely to take you into areas where you have little experience or expertise. This can be scary for some people. However, that is the nature of science. How hard it is depends on your willingness to go into the unknown and study areas that you didn’t even know existed. Most practicing scientists spend several hours a week in the library or on line reading about their subject or teaching themselves something new. The more of this you do, the more rewarding your experience can be and the faster you can reach your research goal. Ultimately, this is up to you. The Training Class is a series of five six-hour classes designed to teach you the fundamentals of electron paramagnetic resonance, how to use the EPR spectrometer properly and successfully, laboratory technique, data analysis, and experimental design. Once you have completed the Training Class, you are ready for the open-ended laboratory research phase. How many students are in a training class? Up to 16 students may be admitted into a given training class, but the number is usually less. What happens after I take the training class? Once you have completed the training class, you can sign up for instrument and laboratory time to begin your research. Why does it cost money to use the SMART Center? The SMART Center operational costs are met through a combination of grants, processing fees, and payments by participants. We don’t have enough money from grants to cover all the material costs, so we ask you to pay. Although this might seem like a lot of money, businesses would charge about $200-300/hour just for use of the instrument. Because of the generosity of Bruker Bio-Spin, our costs are less, but are still significant. To sustain this program, it requires your support. How can I donate money to the SMART Center? The SMART Center is a program operated under the auspices of Steppingstone School for Gifted Education which is organized as a 501(c)(3) non-profit. Donations should be made out to Steppingstone, but with the restriction that the donation be used only for the SMART Center. If you have further restrictions, be sure to make note of those (for example, you may want to donate to a scholarship fund or help purchase exotic chemicals).